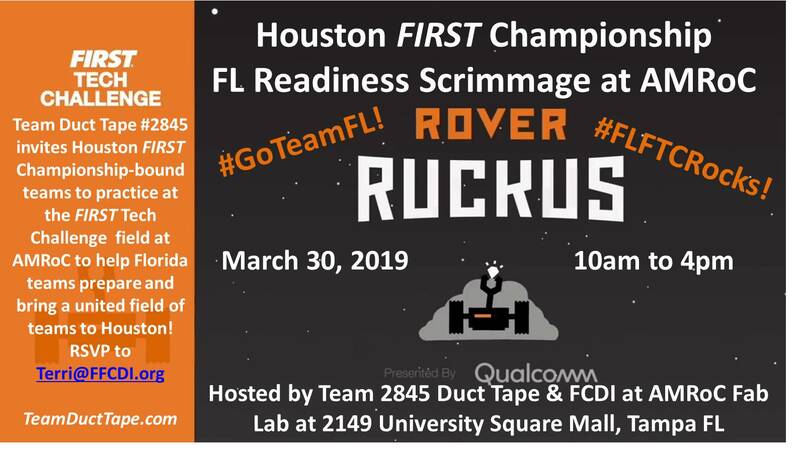 Team Duct Tape invites all our FIRST Tech Challenge Championship-bound teams to a Scrimmage at AMRoC Fab Lab on March 30, from 10am to 4pm. RSVP to Terri@FFCDI.org . Go Teams! TDT Annual New Season Guess the Game! It’s that time of year again! Time for FIRST Tech Challenge Team Duct Tape’s annual Guess the Game Game! This year, we’re going to try again, to give away our homemade duct tape Minion – who ended up living an extra year with us after last season’s live kick off was called on account of bad weather. So Minion is back, and looking for a home with whoever comes up with a guess closest to this season’s actual game challenge. Using the Rover Ruckus teaser video below, and any game hints you might detect in the FIRST Tech Challenge blog, teams attending the West Florida FIRST Tech Challenge Kick Off at Middleton High School this coming Saturday, September 8, can put their best guesses in a box we’ll have there. After the game reveal, we’ll award the Minion to whoever came closest! So, start combing through anything that looks like clues, and we’ll see you on Saturday! Team Duct Tape has earned their place in this years State Championship, within our R.O.B.O.T. league we won three awards: the Judges award for having the best video in the state of Florida, the finalist alliance award (along with Stealth tigers), and the Inspire award, which we are very grateful for. Out of the entire state of Florida, we won the honor of having the highest score for our video. An impressive 86 out of 100 was our score. A lot of sweat and tears went into our video, and we are very proud of how it turned out. Yet another proud achievement of ours is the fact that since Team Duct Tape was formed we have gone to state every year. State Championship will be held at St. Leo University, on February 13th. Team Duct Tape is excited about participating, and we are confident in our robot and abilities. We are hopeful to make it to Super Regionals in Texas. Also, we would like to thank all of our sponsors and supporters of TDT. We could not have accomplished this without your support.